For Sungmin's birthday, we are going to be making him a little Happy Birthday book ^^ There are two ways you can participate: 1) write a happy birthday message, or 2) take a photo of yourself holding a happy birthday sign. You can do one or you can do both! 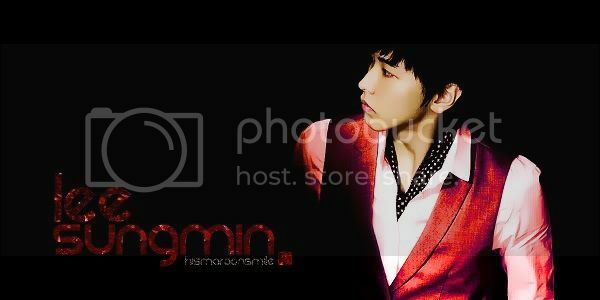 Everything will be compiled into a book that also includes some of the photos perMINent has taken of Sungmin this year. + No longer than 300 words. + Must be in English. + Must wish him a happy birthday somewhere in the message. "Happy Birthday" CAN be in your own language, but the rest of the letter must be in English. + Be respectful. Do not say anything offensive or rude. + Make a sign that says "Happy Birthday, Sungmin" in English and take a photo of yourself holding it. It must say "Happy Birthday, Sungmin" in English. + MUST be at least 800pixels wide or tall. The smaller the pic, the worse the quality is when printed out so please keep them as HQ as possible and don't resize! + You may write "Happy Birthday, Sungmin" or "I love you" in your own language or Korean also, but no other words. Do not write your name on the sign, we will put your name under the photo ourselves. + You may show your face, or you may hide behind your sign - it's your choice! + Do NOT use photos of Sungmin or Super Junior taken by fansites! Their rules are to not edit or reproduce the photos, so do not break their rules by putting them on your sign. Only use official photos of Sungmin or Super Junior that do not belong to a fansite. + Avoid bad lighting! You want him to be able to see your picture after all! + Do not use pics of other artists. + Do NOT just photoshop text onto an existing picture of yourself!! It must be a picture of you really holding your sign. We CAN tell when something is photoshopped into a pic! + Using photoshop to make a sign and printing it out, then taking a REAL photo of you holding it is ok! + Be creative with your sign! Draw cute things, decorate it, etc! DEADLINE: 12/18 USA (which is 12/19 in Asia). We're sorry for the short notice, but this must be done quickly so it can be sent in time. The deadline will not be extended. INCLUDE your name, country and your username here at perMINent in the email. You do not have to be a member to submit a message or photo for the project. We will email you when we've approved your submission or ask you to make changes if necessary. Please give us at least 24 hours to reply. Can we send you a sign and a birthday message, too? About the photo, Can we use his selca pic? arkkk..i only hv 4 days left to work on it..hope i able to make it..fighting!!! umm... if i wanna send a message, shud it be in doc. format? ^ You can do it in doc, or you can just write it into the email itself Either way works! the message must be in English, but can i put few sentences in Korean there?? ^ Yes that's okay Just make sure it's correct please. ^ No, sorry, no personal info on it. so, perMINent will put ourname on the photo/message by yourself right? can't I share it to my Twitter friend ? I don't understand ^^;; Tell your friend about the project? Yes. wait... if i want to sent a birthday message also, what is the format of it? am i just need to write that 300 words English message on email that i will sent to you? or i write the message on a paper, then scan it, and sent the scan via email?